Last weekend, our friend Adam from Get Fresh Farms, delivered some fresh tilapia to us and we made Grilled Tilapia Tacos with Pear Bell Pepper Salsa and Best Boy Brunette Sauce. Yummy! We had a bunch of fish bones leftover so we decided to throw them in a big stock pot with water, onion, carrot, and celery to make some fish stock. 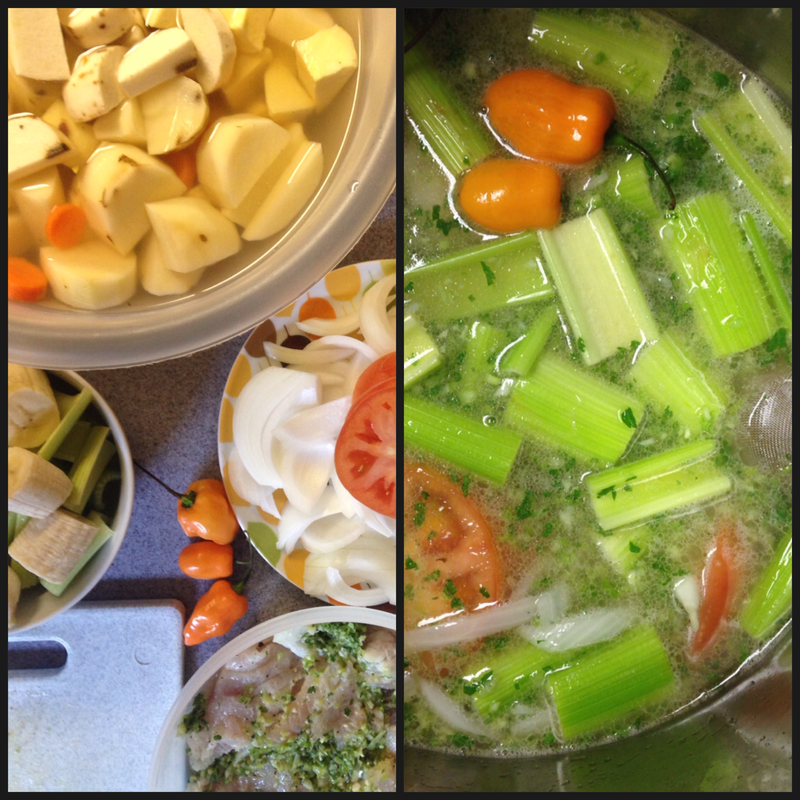 This weekend, we used the fish stock to make delicious Trinidad Fish Brof. I don’t know if I’ve ever had cuisine from Trinidad, but if this dish is any indication of what to expect, count me in. 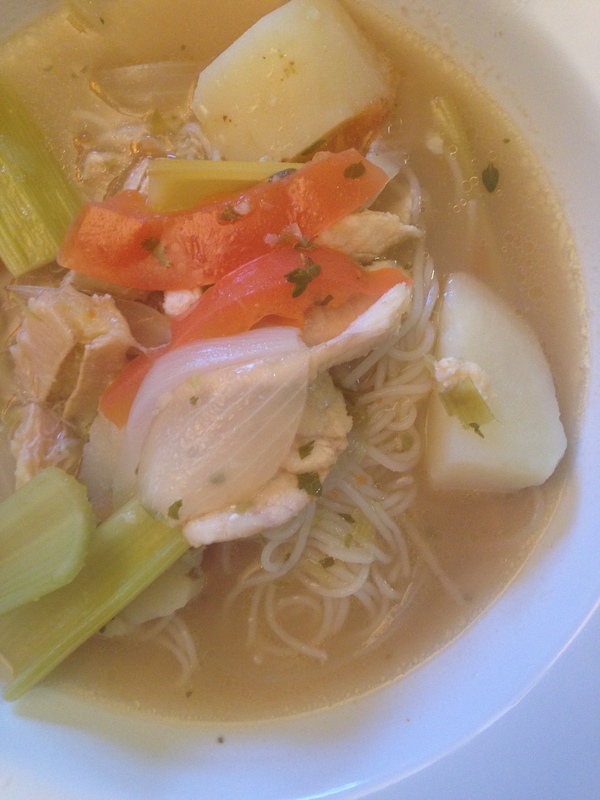 Of course, we are fans of flavorful noodle soups, similar to Vietnamese Pho. I especially like the large chunks of root vegetables, and oddly enough, the bananas. Clean and prepare all veggies. Immerse root vegetables in water to prevent them from turning black. Mince cilantro, garlic, and scallions in a food processor until finely chopped. Season fish with salt, pepper and half of green seasoning. Soak in lime juice. Marinate fish for 1 hour or overnight. Bring fish stock to a boil in a large pot over high heat. Add onion, potato, sweet potato, green bananas, carrot, taro, onion, tomato, celery, thyme, whole hot pepper and the reserved green seasoning. Bring to a boil again, cover and reduce heat to low and cook until vegetables are fork tender but firm, about 20 minutes. Add fish to pot. Cover and cook for about 5 minutes. Do not stir. Add ketchup and lime juice for additional flavor. Stir contents of pot gently to mix. In a separate pot, prepare vermicelli noodles per package instructions.Rinse well. Remove whole hot pepper and sprigs of thyme from soup. Divide noodles into bowls and ladle with broth and veggies.